In between waiting for the paint to dry. I got busy making some custom parts for the tank. 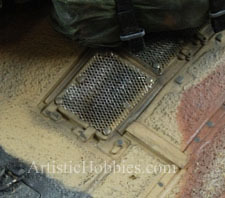 For example, the cables that hang on the lower portion (sides) on the turret were all custom made. Even the brackets that the cables are held up by are custom made from copper flat bar. Next came the ventilation screens, which are located on the top rear portion and left side (main body) of the tank but are mostly covered by the turret. The ventilation screens were made from aluminum micro-mesh. They were cut to size and then placed on the tank held in place by tinny needle heads that look like real bolts. Some of the ventilation screens were painted to match the tank to keep that camouflage pattern flowing. There is a total of 6 ventilation screens in all. Next we added wiring to the smoke grenade launcher. There are a total of 2 smoke grenade launcher on the Abrams. 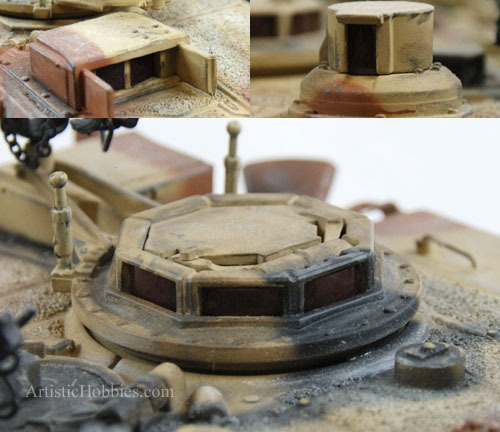 One on each side of the turret. Smoke grenade launchers for tanks and armored vehicles are designed to rapidly generate small amounts of smoke to conceal or screen individual vehicles and troops. A smoke screen can also be laid by an engine operated system.